I had an opportunity to visit the Great Ocean Road region of Victoria recently. I mainly wanted to re-visit a few locations and improve on the efforts of my previous trips. I had mixed results in this regard due to weather (something I will talk about in a future post). I did however, manage to visit a new location with some success. Unlike most of the tourist hot-spots along the coast here, Wreck Beach is much less well known and less visited. This is probably due to the more difficult access and the complicating factor of tide levels. Wreck beach is a small beach just off Moonlight Head where some anchors and machinery are still visible from two ancient wrecks. Both the Marie Gabrielle (1870) and the Fiji (1890) came to grief here and the little that remains of them is now embedded into a reef-like rock shelf. 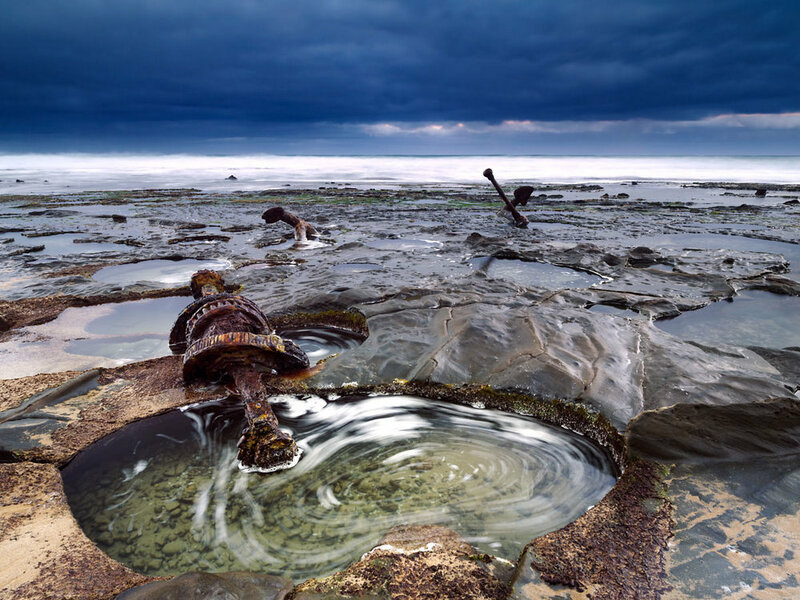 They are well weathered and surrounded by small tidal pools. To find this location you turn off the Great Ocean Rd onto Moonlight Head Rd and follow a gravel track for a few kilometers to a gravel car park. 300+ wooden steps later you are down on the beach where you can head either left or right. Go right and walk about 15 minutes and you will eventually come to the first wreck location. You will have to check the tide levels and only attempt to access the wreck at low tide when the wreckage is exposed and the beach access is good. As always in coastal locations be watchful for rogue waves. I believe the first lot of wreckage you will come to is from the Marie Gabrielle and you have to walk further up the beach to find the second wreck location with its single remaining anchor. I did not venture any further than the Marie Gabrielle as I had little time and preferred to shoot one location properly rather than two hastily. At the Marie Gabrielle there are actually two anchors and what looks like an old gearbox or driveshaft, all thick with flaking rust. I usually prefer not to include man-made elements in my landscape photography, but this wreckage has such an elemental returning-to-the-earth feel, that they have become part of the landscape. They encapsulate for me the impermanence of man-made things and the eternal forces of nature acting on the shoreline. I had hoped for a spectacular red sunrise that might light up the tidal pool in colour but all I got was glowering dark clouds and a short rain shower. I did get a brief glimpse of some sunrise colour as the below image shows but all in all the heavy clouds actually worked okay for the scene. As landscape photographers we work with what the photography gods give us when we are on location. I really liked the setting the wreckage is in. The knee-deep tidal pools (a trap for the unwary photographer) can be used to capture a nice swirling affect from the surface foam. You can walk all around the wreckage without leaving footprints so the composition options are great. I shot mostly with the medium wide angle lens on my Pentax 645z but also gave the ultra-wide 15-30 a go on my Pentax K1 (see the last image below) which allowed for a different low eye-level perspective. The below image shows the effect of using a circular polarizer. All the reflections have gone and instead the detail of the rock and the green algae comes through, a nice counterpoint to the blue sky. I think this neglected location is interesting because it is within half an hours drive of the popular and well photographed tourist traps of the Great Ocean Road (like the Twelve Apostles and London Bridge) yet is every bit as photogenic - or even more so. In fact I think it is the best landscape photography location on the GOR!